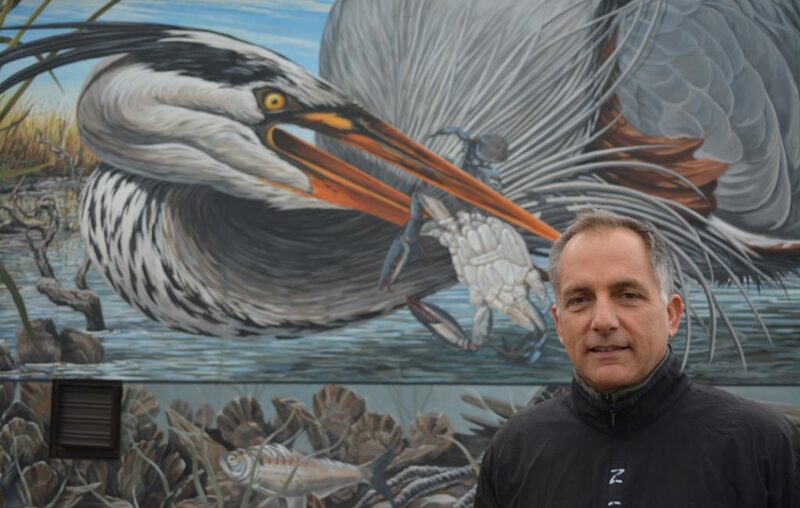 Michael Rosato specializes in designing and painting large-scale murals for public and private spaces. Corporations, museums and individuals have commissioned Mr. Rosato to create artworks for display in museum exhibits, corporate headquarters, retail spaces, restaurants, sports arenas, outdoor venues and private residences. Mr. Rosato paints most of his works on canvas in his studio in Cambridge, MD., then personally installs the finished paintings on site. Mr. Rosato’s paintings can be seen in venues across the country, including the Oklahoma City National Memorial in Oklahoma City, OK, Texas Motor Speedway, in Fort Worth, TX, the Smithsonian Museum of Natural History in Washington, DC, the Loudoun Heritage Farm Musuem, in Sterling, VA, the Headquarters of Bacardi in San Juan, Puerto Rico, the Texas Ranger’s Ballpark in Arlington, TX, the U.S. Fish and Wildlife Museum in Cape Charles, VA, the Virginia Military Institute in Lexington, VA, and the Chesapeake Country Mural Trail in Dorchester County, MD.